The Ben & Jane Norton Culinary Arts Center is home to the LCCC Culinary Academic program and the Culinary Arts Institute at LCCC. The space includes a variety of commercial and demonstration kitchens, a bakeshop, a digital arts center and the theater program’s costume shop. The dedication of the Ben & Jane Norton Culinary Arts Center on December 12, 2012 celebrated the lasting legacy of philanthropy and the ability of philanthropists to inspire hope in the lives of those coming to the Lorain County Community College campus to begin new careers and a new chapter in life. Nearly a decade prior, the need for individuals trained in hospitality, tourism and the culinary arts field became apparent. At the time, Jane Norton was serving on the College’s District Board of Trustees and was part of initial efforts to develop a culinary arts program. As a retired dietician, she had a special interest in seeing the program launched. After countless hours spent developing curriculum, seeking out potential partners and recruiting experienced faculty, the only thing that stood in the way of the launch of the new program was the lack of a facility with the necessary equipment and commercial kitchens to support the program. With only limited state and local funding resources, it was evident that such a facility could not be built without philanthropic support. 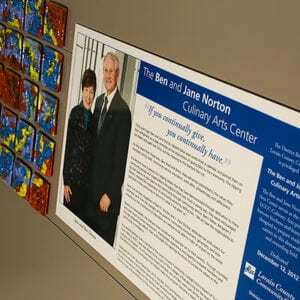 Ben and Jane Norton, along with other dedicated supporters of the Lorain County Community College Foundation, co-chaired a major gifts campaign launched in 2008. That campaign was successful in securing funding for the construction of the culinary arts center along with other critical projects to keep Lorain County Community College on the forefront of responding to community needs. As with any project the Nortons lead, they led by example, committing their own philanthropic support to the campaign. The Nortons grew up in Lorain County, raised their three sons in Lorain County and Lorain County Community College is incredibly grateful for the investment they have made in the future of the Lorain County Community through their support of the College.